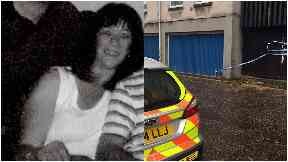 Moira Gilbertson, 57, was found dead at a flat on Dumbiedykes Road in Edinburgh. Moira Gilbertson: Family said she will be 'sorely missed'. The family of a woman who was allegedly murdered have paid tribute to a "loving mother". Moira Gilbertson, 57, was found dead at a flat on Dumbiedykes Road near the Scottish Parliament in Edinburgh on Saturday morning. Roger Crossan, 52, has appeared at Edinburgh Sheriff Court charged with her murder. Ms Gilbertson's family have described her as someone who will be "sorely missed". They said: "Moira was a loving daughter, mother, sister and aunt. She was much loved by her family and she will will sorely missed. "We request that our privacy is respected at this sad and difficult time."